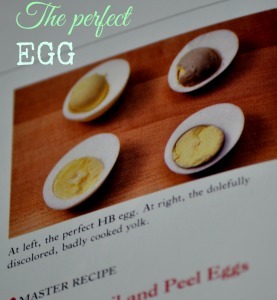 The perfect egg has a tender white, fully set yolk, easily peel-able shell and most importantly no green tinged yolk. We all have had eggs that have a yolk tinged with greenness like the one on the picture below. cooking the eggs the proper way prevents the dark green sulfur lining from forming around the yolk. The unappetizing chemical reaction that causes the green tinge around the yolk is because of too much heat. 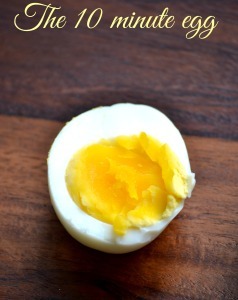 Perfect Boiled egg is here. Picture from Julia Child’s Way to cook. Lets boil some eggs now! To me the perfect egg is a 10 minute egg. Here’s how. Boil water in a pan until simmer. How much water? So how much water do we need to add to the pan. To put it simply, the water should cover the eggs by 1 inch, So use a tall pan. If you want exact measurements, 5 eggs would need about a liter of water. Immerse the eggs gently in the pan. 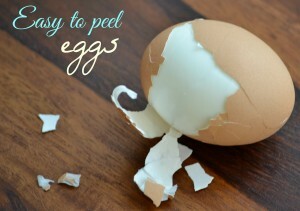 Eggs put in hot water in the beginning are easy to peel later. So always let the water boil before adding the eggs.The water should boil gently. NEVER a roaring boil. Eggs cooked in fiercely boiling water results in rubbery egg whites. Too much heat toughens the albumen and makes the inside yolk green and rubbery. Boil for 10 minutes. Yes. Exact 10 minutes.take out the eggs and put it in cold water for 5 minutes. This will allow the eggs to cool and the the stinky sulfur inside the eggs to dissipate in the water. Resting the eggs in cold water can also prevent the dark green line from forming and they become easier to peel and handle too. Crack an egg all over gently. Then peel. It should peel off easily. If it doesn’t peel easily, peeling under a thin stream of cold water in the sink usually helps. Eggs are so versatile. Boiled,steamed,stuffed,poached,scrambled ….Go have fun! Thank you for posting such yummy and authentic recipes.. Perfect egg and got appreciation from my husband. His colleague also appreciated.. Thanks to you…. Thank you so much Maithra. I am really happy you are getting perfect eggs every single time. Simple, Good and very important tip. I always ran into over-boiling or under-boiling the eggs. After this article, it has made very easy for me. The eggs look and taste much better. 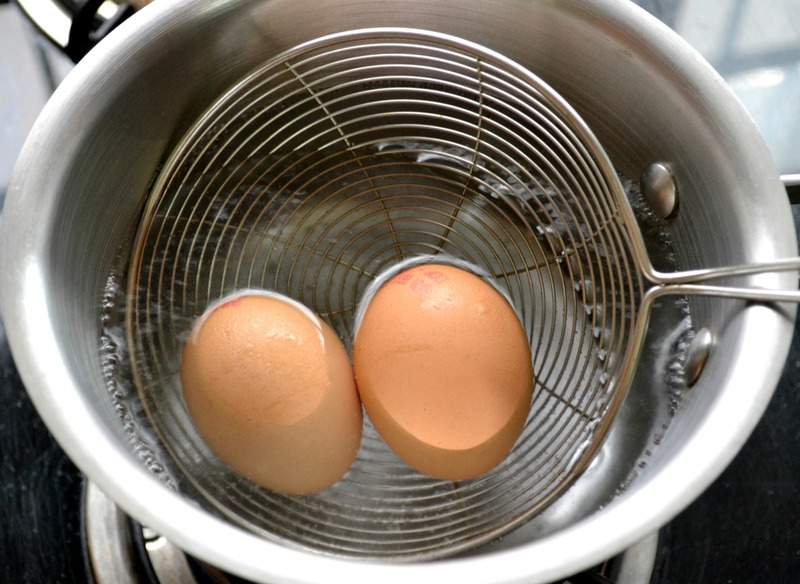 This Julia Child recipe for perfect boiled eggs is a fool proof recipe. Good eggs every single time. Thanks for stopping by.